If you've decided to bring a new doggie home, you're probably worried about how Rover at home is going to react. Though there's a chance he might resent your decision a bit -- this should only be temporarily. 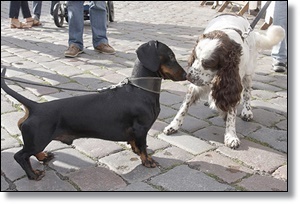 Introducing two adult dogs can be a challenge and you need to be careful to avoid an all-out war. Hopefully, the pooches will eventually become friends and have lots of fun together. However, it's up to you to make that happen. Your first responsibility is to your current dog. After all, you don't want to put him in a situation he'll hate or be miserable in. If Rover is a quiet, old dog, don't bring home a hyper teenage dog who will drive him crazy. When adopting from a shelter, always find out the past history of the new dog. If he was abused or has a dominant character, this might create problems with your doggie back home. Is Rover a high-energy, always-running pooch? Then getting a companion with the same level of energy could be great -- they can play together and tire each other out. To read more on this story, click here: Will My Dog Be Ok If I Adopt Another?